In attempting to characterize cellular and molecular processes, it often becomes necessary to label — either through immunofluorescence or immunohistochemistry — two or more targets in the same sample. This type of labeling provides insight into the localization of independent targets within cells or tissue and can help determine whether two or more targets co-localize under different experimental conditions. However, cross-reactivity and non-specific binding of antibodies makes double-IF challenging for many researchers, especially when using primary antibodies with a high degree of immunogen sequence homology. In this post, we present several techniques for double-IF staining using various combinations of primary antibodies, as well as some general guidelines for optimizing and troubleshooting such experiments. While double IHC labeling is possible under certain circumstances, we most often recommend immunofluorescence as the detection method. The wider range of available fluorophores makes it easier to select conjugations with little to no signal interference. In addition, the combined, overlapping fluorescence produced by co-localized targets is easier to characterize than overlapping IHC staining. The excitation and emission spectra must be carefully considered when choosing fluorophores. Overlapping excitation ranges may result in false positive results as both fluorophores will be activated by the same light wavelength. In the same regard, overlapping emission spectra can make it difficult to differentiate unique probes. 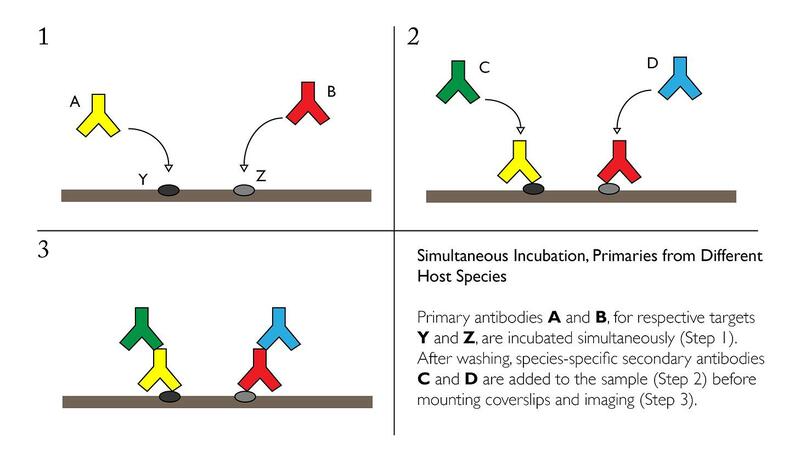 Primary antibodies from different species can be incubated simultaneously if the conditions for IF staining have been optimized independently. A mixture of the two primaries at their respective dilutions can be applied directly to paraffin-embedded or frozen sections overnight at 4°C with gentle agitation. Incubate with mixture of fluorescently labeled secondaries for 1 hr at RT in the dark. Secondaries can be raised in the same species (e.g. goat-anti-mouse and goat-anti-rabbit), but must 1) be reactive to the respective primary antibodies and 2) be conjugated to fluorophores with distinct emission spectra. 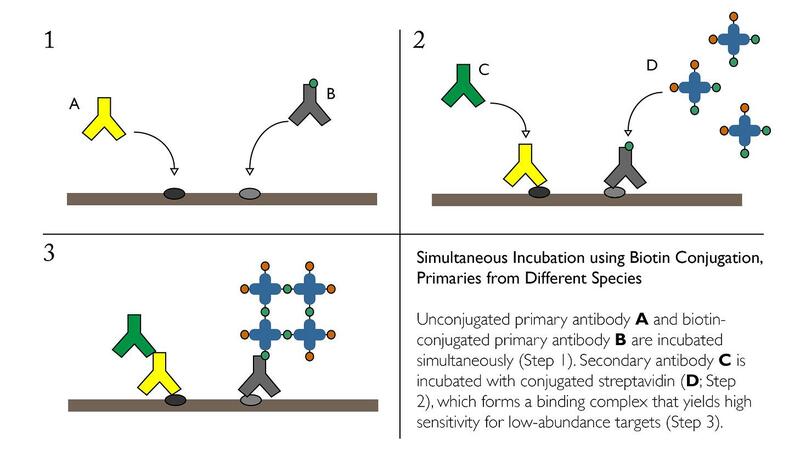 If cross reactivity of your secondary antibodies presents an issue when using simultaneous incubation of primaries, one alternative is to incorporate Avidin-Binding Complex or similar systems on one of the targets. This strategy may also be useful if one of the desired targets is in low abundance. Mix biotin-conjugated primary and unconjugated primary at the optimized dilution for each antibody in 1% blocking solution in TBS or preferred buffer. It is recommended that biotin-conjugation be used to detect the protein with expected lower abundance, as ABC staining will increase sensitivity. Incubate with mixture of 1) fluorescently labeled avidin or streptavidin (e.g. FITC-streptavidin) and 2) fluorescently labeled secondary for the unconjugated primary for 1 hr at RT in the dark. Cross-reactivity can be mitigated in some cases through the use of one or more conjugated primary antibodies. Since these products are directly linked to a fluorophore or other reporter molecule, it eliminates the need for another secondary antibody, reducing the risk for non-specific labeling. Conjugated primary antibodies are best suited for high-abundance targets, and should be applied after any unconjugated/secondary pairs. Incubate with fluorescently labeled secondary antibody for 1 hr at RT in the dark. Application of primary antibodies from the same species is not recommended. 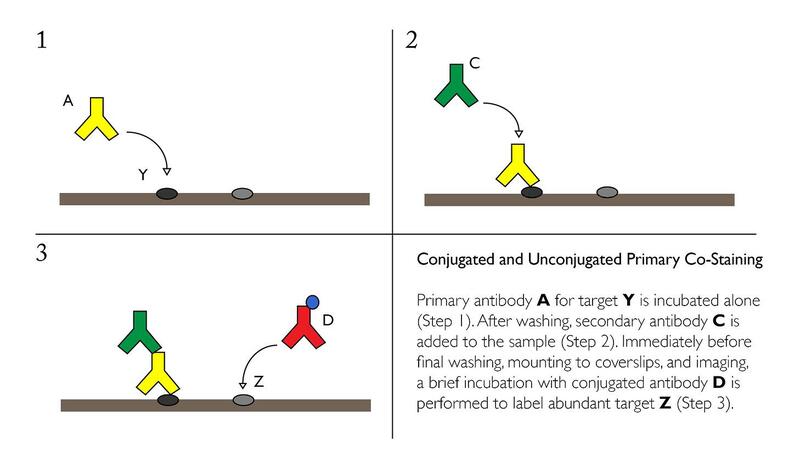 Secondary antibodies are extremely likely to cross react, resulting in non-specific labeling. 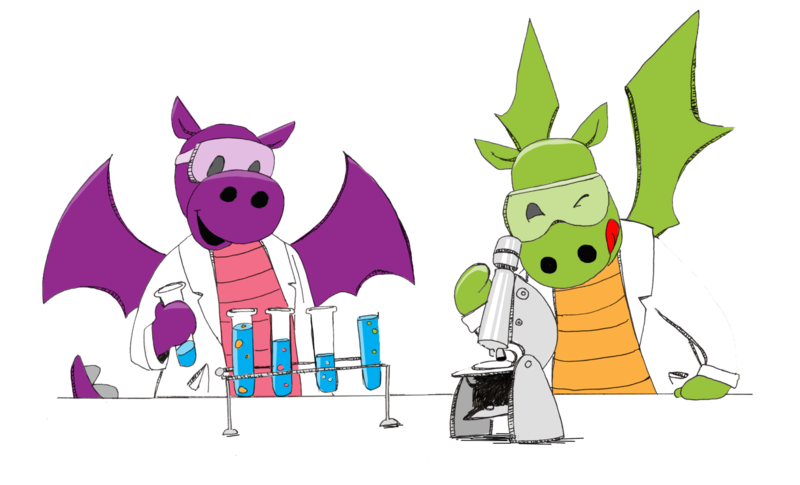 If you decide you must use two primary antibodies from the same species — likely due to limited availability of antibodies targeting the necessary proteins — we recommend that you contact our Scientific Support team at technical@stratech.co.uk for a custom assessment of your experimental conditions and protocol. One final alternative to double immunofluorescence is to label serial sections independently and attempt to interpret localization by examining closely related tissue. 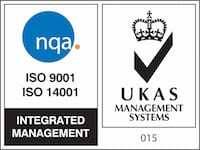 This allows the greatest range of flexibility for choosing antibodies and pretreatment conditions, as each tissue section can be treated under optimized protocols. However, serial sections will not provide proof of co-localization, since the fluorescent labels are not able to interact within the same tissue structure. Image credit: Chen, M. et al. “Hydrogen protects lung from hypoxia/re-oxygenation injury by reducing hydroxyl radical production and inhibiting inflammatory responses.” Scientific Reports. 22 May 2018.